established as an unincorporated, not-for-profit, voluntary organization, not affiliated with any political party. Members and affiliates are residents of the greater Brockport, NY area. 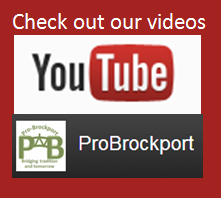 All content posted on the Pro-Brockport site is for informational purposes only. Posts by individuals are the views and opinions of the author and do not necessarily represent the organization of Pro-Brockport. We value input, from various sources, that have researched facts and have an understanding of issues concerning the greater Brockport area. All posts from sources outside the Pro-Brockport Organization are noted and authors are credited for their contributions.